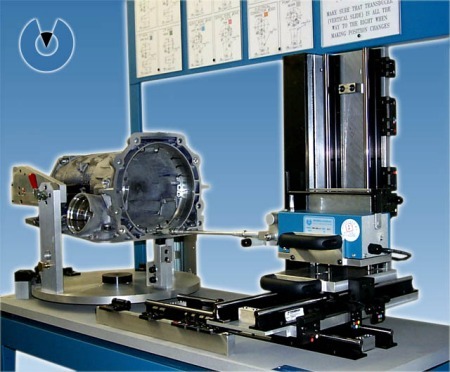 The system features the PDI's robust and easy-to-use Surfometer Series-800 system and a sophisticated custom fixture to enable accurate and productive measurement of surface finish on a transmission case at multiple locations. 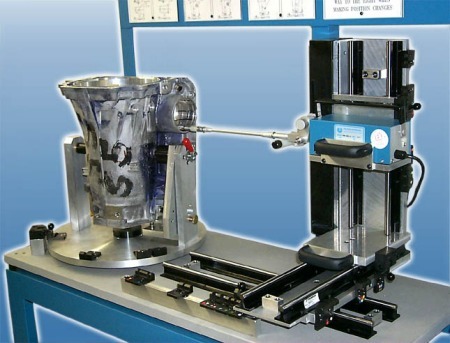 The pilotor (or traverse unit) is mounted on an XYZ translation slide and the part is mounted on a rotary table with two rotational degrees of freedom. 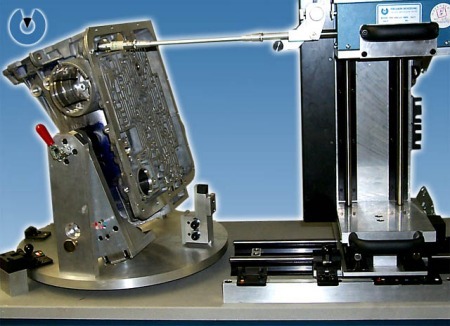 Locking mechanisms are provided to ensure safe and accurate measurement at each location. 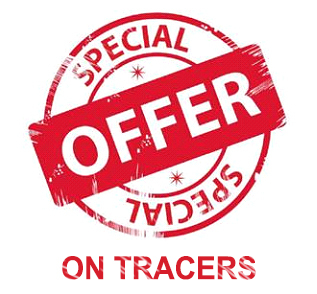 A total of five degrees of freedom allows the relative positioning of the part and tracer such that 13 locations where surface finish is specified can be conveniently checked. A wall chart with color-coded check locations and their surface finish specifications is an integrated part of the system (the system even comes with the wall included!). The color codes on the wall chart match color codes on the adjustment mechanisms on the translation slide and rotary table.